In addition to our traditionally-strung lap and floor harps, Stoney End also makes a selection of cross-strung and double-strung specialty harps. These unique instruments open up a world of musical possibilities—such as frequent key changes, alternate tunings, echoing, and counterpoint. You’ll be amazed by what these many-stringed harps can play! *Base price includes an extra set of strings, harp book, tuning wrench, and harp base or strap buttons. Package price includes all of the above, plus harp bag, harp base bag or strap buttons, and a mini-chromatic tuner. Prices shown are just a few of the many options avaible. Please contact Eve Stone for the full range of options. 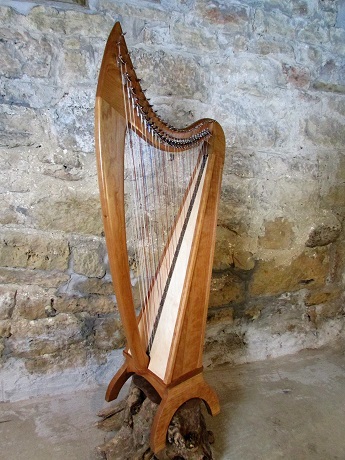 The Esabelle Cross-strung harp is a fully chromatic lap harp. One set of strings are the natural notes or “white keys” on a piano, and the second set are the sharps and flats or “black keys”. The two sets of strings cross in the center, allowing the full chromatic range to be played with each hand. This harp is vital for new age, jazz or world musicians, who often require frequent key changes, accidentals, and non-western tunings. Requires no lever sharpening or re-tuning. Dimensions: H-31½" x W-9" x D-19"
The Cross-Strung Rebecca harp is a fully chromatic floor harp with a four-octave range. One set of strings are the natural notes or “white keys” on a piano and the second set are the sharps and flats or “black keys”. The two sets of strings cross in the center allowing the full chromatic range to be played with each hand. This harp is vital for new age, jazz or world musicians which may require frequent key changes, accidentals and non-western tunings. Requires no lever sharpening or re-tuning. Dimensions: H-58" x W-27" x D-13"
The Brittany is a Celtic style 2- by 22-string harp. With one set of 22 strings on each side, the Brittany can be tuned in unison for echoing and counterpoint, or tuned differently to accompany with pentatonic or alternate tunings. The Double-Strung Brittany is a perfect travel practice harp, as it enables you to practice with both hands on a small instrument. Dimensions: H-29" x W-9" x D-19"
The Eve is a Gothic style 2- by 22-string harp. With one set of 22 strings on each side, the Eve can be tuned in unison for echoing and counterpoint, or tuned differently to accompany with pentatonic or alternate tunings. The Double-Strung Eve is a perfect travel practice harp, as it enables you to practice with both hands on a small instrument. Dimensions: H-30½" x W-9" x D-16"
The Double-Strung Lorraine is a Gothic-style 2- by 29-string harp. With one set of 29 strings on each side, the Lorraine can be tuned in unison for echoing and counterpoint, or tuned differently to accompany with pentatonic or alternate tunings. The Double-Strung Lorraine harp opens up a world of accompaniment options and suits diverse playing styles. 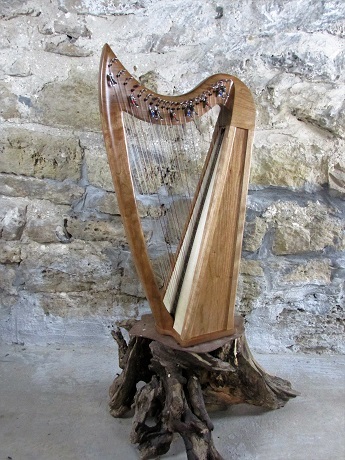 Dimensions: H-49.5"½" x W-11.75"½" x D-23.5"
Why choose a Stoney End harp? How are Stoney End harps made? What makes Stoney End harps unique? How do I choose the right harp? Does Stoney End fill custom harp orders? I’ve always wanted to learn to play harp — can Stoney End help me? Can I have a harp shipped to me? © Stoney End. All rights reserved.